Following on from my post Easy Quilts For Beginners, I’ve put together some free quilt patterns for beginners. Once you’ve mastered piecing basic strips or squares then you’ll be looking for something a bit more challenging, These are still easy quilts, just a step up if you’re fairly new to quilting. Probably the easiest step from the very basic easy quilts is to make a jelly roll quilt (find out what a jelly roll is here). This is a video taking you through the steps, it’s really simple! This one listed on Craftsy called Grandmother’s Puzzle Block is pretty and can be made with fabric scraps you have in your stash. 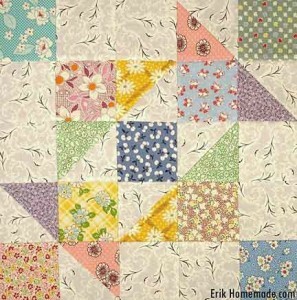 You can use big, beautiful and contrasting scraps to show this block off! The block is 15 x 15-inch and the free pattern shows you how to easily piece it together. You can make as many blocks as you like depending on the size of the finished quilt you’re looking for. 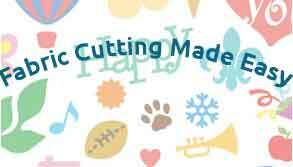 The next resource is from AllFreeSewing, 40 free quilt patterns for beginners broken down into 3 sections. Free Quilt Patterns You’ll Love – these are complete patterns from table runners to baby quilts. Free Quilt Block Patterns for Projects – Instead of trying to tackle an entire quilt, why not make quilt blocks that are super quick. Start with something small and see where your creative juices take you. 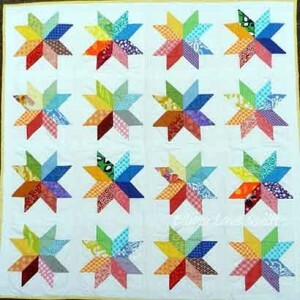 The free quilt block patterns featured here are pretty and colorful. Using quilt blocks you can do smaller projects, larger projects or simply sew together a few of your favorite fabric scraps. More Free Easy Quilt Patterns -These are a bit more advanced but still classed for beginners so you won’t feel too challenged. This is a great tutorial from Ellison Lane, a star flower block. You’re moving on now from straight strips, rectangles and squares! Ellison shows how you can cut and get 2 blocks at the same time, step by step with images for each process, it’s an easy tutorial to follow. If you want to print it, press “ctrl p” there’s no “print” button on the tutorial. That’s enough to be going on with I think, plenty to choose from for now. 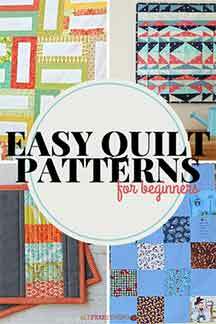 I will be adding more free quilt patterns for beginners as I find them. If you find any good quilt patterns you’d like me to add, drop me a comment or contact me.